Marauders is a 2016 action crime thriller film directed by Steven C. Miller and written by Michael Cody and Chris Sivertson. The film stars Christopher Meloni, Bruce Willis, Dave Bautista, and Adrian Grenier. The film was released on July 1, 2016, by Lionsgate Premiere. In Cincinnati, four thieves commit an armed robbery stealing $3 million in cash from Hubert National Bank. The crew's leader executes manager Steven Hutchinson point-blank. FBI Special Agent Jonathon Montgomery heads the joint robbery-homicide investigation with Cincinnati PD. Forensics techs find a print matched to a dead Army Ranger named TJ Jackson. According to the official report, in 2011, TJ's unit went rogue, capturing civilian Alexander Hubert to collect a ransom. The exchange went awry and Alexander and the Rangers were killed by a Special Forces team. TJ's body was never recovered. As the sole heir, Jeffrey Hubert, Alexander's brother, became president of Hubert International. By tracking the serial numbers, the FBI discovers the $3 million to have been donated by the thieves to a City Mission charity fund. In a second heist at a different Hubert bank location, the thieves steal cash and the contents of personal safety deposit boxes belonging to Hubert and Ohio Senator Cook. David Dagley, a member of Hubert's security detail, is lured to the bank then stabbed to death in an ambush. The killer leaves a .45 bullet with TJ's fingerprint on it. Dagley was Commanding Officer of the Rangers who snatched Alexander Hubert, but didn't take part in the ransom scheme. The getaway vehicle is discovered registered to TJ's brother, James. Montgomery receives photo evidence of an apparent homosexual affair between Hubert and Cook and the thieves hack Montgomery's laptop and Skype call him hoping to persuade him to look into Hubert's corruption. Converging on the Main Branch for the third robbery, the thieves surprise the FBI during an interview with Hubert. High-powered rifle firefights erupt across the lobby as the men engage in close quarters combat. One thief is killed and the three others retreat into the downtown traffic. Victims Hutchinson and Dagley are found to be old members of an elite platoon with Cook. Montgomery is sent a file stolen from Hubert detailing the conspiracy to commit murder and military cover-up. It leaks to the media and the truth finally outs; Hubert conspired with Cook to prevent Alexander from taking over the company. They briefed the Ranger unit with false mission intel of a terrorist threat in Costa Rica. The Rangers sent in were then assessed as rogue agents and ambushed by a Special Forces team with no knowledge of the Rangers innocence. TJ was the sole survivor, saved by then Special Forces sniper Wells. With his assets frozen, Hubert hastily makes large unauthorized cash withdrawals to flee the country. TJ is tracked by the FBI to a concert venue and taken into custody. FBI Special Agent Wells is revealed to be the thief crew leader with three special forces members that attacked TJ's squad as accomplices. He planned the heists as vengeance for the Ranger massacre he regrettingly took part in. Recalling a key detail in a map location, detective Mims correctly predicts Wells as the thief and arrives just as Wells preps to leave the stash spot with the stolen heist cash. Tormented by a guilty conscience and his wife's terminal cancer prognosis, Mims pleads with Wells to allow him to return the stolen money and atone. Wells tries to reason with Mims but kills him as Mims raises his weapon. Some time later, Montgomery tracks Hubert to Mexico. He finds Wells preparing to kill Hubert in a restaurant and suggests Wells absolve his transgressions by using the stolen money to help others. Montgomery takes a seat at Hubert's table, sips wine in remembrance of his wife, then stabs Hubert to death with a concealed blade. Wells shoots Hubert's bodyguard dead, shares a glance with Montgomery, and then leaves. On September 9, 2015, it was announced that Steven C. Miller would be directing a bank robbery film Marauders based on the script by Michael Cody and Chris Sivertson. Bruce Willis, Christopher Meloni, and Dave Bautista would star in the film, which Emmett/Furla/Oasis Films would finance and produce while Lionsgate Premiere would release it. Lydia Hull, Tyler Olson, Christopher Rob Bowen, and Danny A. Abeckaser would also star in the film. Randall Emmett and George Furla would produce through Emmett/Furla/Oasis Films along with Joshua Harris and Rosie Charbonneau through 4th Wall Entertainment. On September 25, 2015, Adrian Grenier joined the film. Principal photography on the film began on September 25, 2015, in Cincinnati, Ohio. First-day filming took place at the Dixie Terminal building. On September 26, 2015, filming was underway at the Stock Yard Bank & Trust, which was transformed into Hubert National Bank. Filming also took place in Downtown Cincinnati and Over-the-Rhine through October 16. The film was released on July 1, 2016, by Lionsgate Premiere. Marauders received negative reviews from critics. On Rotten Tomatoes the film has a rating of 25%, based on 16 reviews, with an average rating of 4.0/10. On Metacritic the film has a score of 42 out of 100, based on 6 critics, indicating "mixed or average reviews". ^ "Marauders (15)". British Board of Film Classification. December 16, 2016. Retrieved December 16, 2016. ^ "Marauders (2016)". The Numbers. Retrieved 23 September 2018. ^ a b c Fleming Jr, Mike (September 9, 2015). "Bruce Willis, Christopher Meloni & Dave Bautista Plot 'Marauders'". deadline.com. Retrieved September 27, 2015. ^ Fleming Jr, Mike (September 25, 2015). "Adrian Grenier Joins Bruce Willis Thriller 'Marauders'". deadline.com. Retrieved September 27, 2015. ^ a b KIESEWETTER, JOHN (September 24, 2015). "'Marauders' Filming At Dixie Terminal Friday". wvxu.org. Retrieved September 27, 2015. ^ Molski, Henry; Butts, Rebecca (September 26, 2015). "Willis movie 'Marauders' begins filming in Cincy". cincinnati.com. Retrieved September 27, 2015. ^ Slead, Evan (2016-06-01). 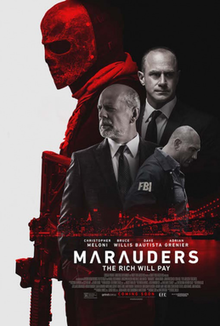 "Marauders trailer pits Bruce Willis against Christopher Meloni". EW.com. Retrieved 2016-07-02. ^ "Marauders (2016)". Rotten Tomatoes. Retrieved July 10, 2016. ^ "Marauders reviews". Metacritic. Retrieved July 21, 2016.